Chiefly associated with jack pine, including wet depressions, but also with oaks, on dolomite pavement of Drummond Island, in fens, and on banks of streams and lakes. 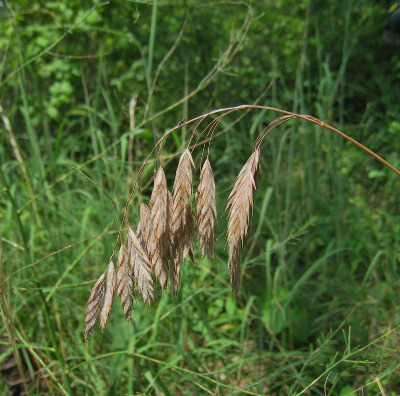 A rare specimen of B. pubescens with the first glume weakly 3-nerved might run here but could be readily distinguished by its longer awns and anthers. MICHIGAN FLORA ONLINE. A. A. Reznicek, E. G. Voss, & B. S. Walters. February 2011. University of Michigan. Web. April 19, 2019. https://michiganflora.net/species.aspx?id=2035.